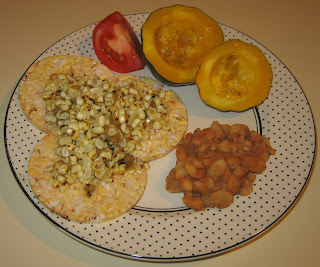 Tonight, I tried another "three sisters" creation using the ancient Native American staples of corn, beans, and squash. The beans were simply canned organic butter beans that I mixed some salt and red chili powder into, and the squash was also easy, just small acorn squash that I baked (375°F for about half an hour or so) and served with Earth Balance margarine and a little dill weed. I purchased an interesting crispy treat variation of rice cakes in the store a few days ago, multigrain "corn thins". I roasted over a flame three small-medium ears of corn for my wife and my dinner, stripped the kernels, mixed in a little salt and Earth Balance margarine, and a 2-ounce single serve packet of "Flame Roasted Green Chile Singles" from 505 Southwestern. It was good, though not exceptional as my first try at a "three sisters" meal. It was fun picking up and eating the crispy corn thin with freshly roasted kernels on top. The heat was about right for my wife and me. Let me begin to describe the meals that we had on vacation. Our flight on the 14th arrived non-stop in Las Vegas. We were amazed to have read about a place Ronald's Donoughts (4600 Spring Mountain Rd [1.5 miles W of the Strip], 702-873-1032; 4a[!! ]-2p Su, 4a-4p every other day) run by Janie and Henry Kang (originally from Southeast Asia) for about 16 years now. We went there and LOVED the inexpensive (I think it was 70 cents for a doughnut or a dozen for $6!!) and oh-so-tasty (it's been years since I've eaten at a doughnut shop; their good tasted very convincing to us and friends who weren't even vegetarian!) vegan treats!! We kept a stash in the car for the trip. I'm going to put together a "Las Vegas Night" event and order doughnuts to be shipped overnight, perhaps sometime in 2008. I can't wait to have another doughnut! We also were excited to know that there was an organic, vegan, raw restaurant, Go Raw Café. In fact, there are two locations, including one just two miles southwest of the airport (2381 E Windmill in Smith's Plaza, 702-450-9007, M-Sa 10-9, Su 8-5), and another in The Lakes Center (western part of city; 702-254-5382, 2910 Lake East Drive, M-Sa 9-9). We enjoyed a nice meal there; I had some items from their salad bar, including good guacamole, and "Vegi-coti" - "soft tortillas filled with 'spinach-ricotta', veggies and marinara sauce. 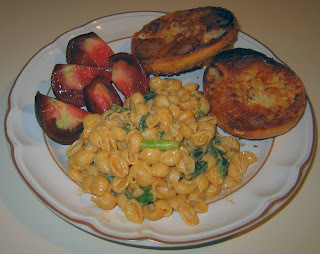 Served with a side of pasta primavera and a blend of pesto, marinara, olive oil, garlic, sun~dried tomato. $12.95". We enjoyed free samples of "bread sticks" so much that we purchased several packets that served us well during our hikes and time during the vacation. We also were impressed with a Whole Foods Market in Las Vegas, possibly the biggest of their stores that we have ever visited. We stayed with friends (our Servas hosts) in St. George, Utah for two nights; that first night, they made a tasty couscous dinner. We all went out Monday night to Benja Thai in town; it was reasonably good (I think I had a noodle dish). Tuesday and Wednesday nights, we stayed at/near Bryce National Park. Eating a plant-based diet is probably the very best thing one can do for the environment, and it amazes me how this "elephant in the room" is usually ignored. The Park services seemed to be fairly environmentally conscious, but it took a little discussion to make sure we would get vegan dishes - it seems to me that eating anything other than vegan should take some work, not vice-versa! The lodge had two dishes, a pasta with tomato sauce and a grilled portabello "steak", that could be suitable, as long as the "steak" were grilled in a clean pan. We had one of each the first night; it was reasonably good, supplemented with multiple trips to the salad bar. We had a good server, and he took my suggestions for a custom meal the next day, pasta with grilled vegetables. I will pick up tomorrow or soon thereafter with the rest of our meals from vacation. I finished the whole wheat fettuccine with flax that I had opened earlier this month before my vacation today in a simple meal. 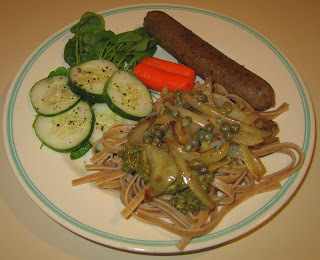 I simply served the noodles with pesto sauce, grilled onions, and capers, with a grilled artisanal vegan apple-sage sausage by the Field Roast Grain Meat Company. I had a fabulous almost-two-week vacation to the Southwest, with hilights including a number of national parks in Utah that I'd visited back in 1997 (Bryce, Zion, Arches, and Capitol Reef), as well as Colorado's Mesa Verde and my first visit to New Mexico. It was all new to my wife and we both loved the trip. We left on Sunday the 14th; my wife returned this past Tuesday, and I stayed on through Friday. I hope to post more details, including information on our meals, soon. 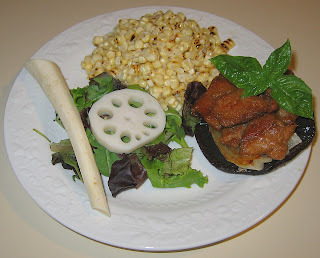 For now, let me describe a meal that I put together that was inspired by "the three sisters", a phrase referring to beans-corn-squash, the staples in the diets of Ancestral Puebloans (prehistoric "Anasazi" peoples) and others ancient, as well as contemporary, peoples of the area. Corn would provide support for the bean vine, and squash would fill in underneath, preventing weeds. I cut a quarter or third of a package of tempeh into thin (maybe 1/4" thick) rectangles, perhaps 1/4" x 1/2" and began sauteeing it. 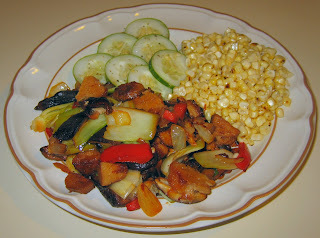 About five minutes later, I added a medium-sized zucchini, cut into medium angular chunks. As the zucchini started to brown (and the tempeh was more fully browned), I stripped kernels from two small ears of corn directly into the pan, something I've not done before. I stirred for a minute or two. One interesting food item that I found in New Mexico was chile sauce, consisting almost exclusively of ground hot chili peppers. I like the spice and heat, and wanted to bring back a jar or two, but settled on a package of six 2-ounce single serve packets of "Flame Roasted Green Chile Singles" from a company called 505 Southwestern. Its ingredients are simply green chile peppers, lime juice, garlic, and salt. I added a packet of the sauce to the zucchini and tempeh, as well as a little (maybe 3 tablespoons) of Lars' Own crispy onions and maybe 1/4 teaspoon of salt, stirred for half a minute, and served. I quickly cooked green beans over medium heat and very little oil for just a minute or so till they turned deeper green, mixed in a little salt and red chili powder, and served them, as well. I also included a tasty apple that I picked from a bed and breakfast that I stayed at in Santa Fe. My wife and I loved the dinner! I really am pleased with the main course and am thinking of adding it to my cookbook (to the American chapter? The Mexican one?). The heat was about right for us, though another half packet of the sauce would have been okay. I practically wiped my plate clean! By the way, late tonight (actually, around 3:30a Monday morning), our vegetarian society's amazing webmaster got our online reservations system up for Thanksgiving! We again expect to host the country's largest vegetarian Thanksgiving with around 500 attendees. People have been asking about when they could reserve since early summer! Join us if you can, dear reader - we get regulars from a number of states, far and wide. Do at least check out our menu posted on the event site, trianglevegsociety.org/thanksgiving07. I just got back from vacation late last night (I was due around midnight but the flight was three hours delayed - and on top of a three-hour layover! - which got me home around 4a!! ), but was excited to make my first meal in a few weeks. 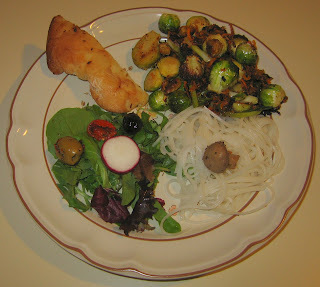 I used ingredients that I had on hand, including Brussels sprouts (that kept just fine), salad ingredients that my wife had picked up, and what was left of some tasty garlic flat bread that we had picked up at the Santa Fe farmer's market (New Mexico). I simply made a saute of halved Brussels sprouts, tempeh chopped into small pieces, and a shredded sweet potato, adding an entire bunch of inch-long sliced green onions for a few minutes at the end, and served it with boiled rice noodles. The main course was a surprisingly delicious combination! I steamed the five large artichoke hearts I had found on sale a few days back for just 50 cents apiece; we each had two and saved the fifth. I made a simple dipping sauce with melted Earth Balance margarine, fresh lime juice, fresh herbs (rosemary and oregano), freshly ground black pepper, and salt. I also grilled on my cast iron pan halved zucchini, face down and with a sprig of rosemary on the open face. My wife is back from her trip! She had a very long journey from her hometown, taking about 2 days, and returned around 10p tonight. It's great to have her back. I was amazed at the store yesterday to find large artichoke hearts on clearance for 50 cents each, when they're normally $2.50-3.50 each - and nothing appeared wrong with them. I was going to make a squash and artichoke dinner for her homecoming, but she called from a connecting airport to say that she feels like something very light like my Mom's homemade dhal (lentil soup); as my Mom had some ready and could easily make plain, white rice, that was my wife's dinner! For my dinner, I chopped two medium Yukon Gold potatoes into bite-sized chunks and mixed in a small shallot that I had cut into 1/4" slivers running the length of the bulb, as well as a little olive oil, salt, and freshly ground black pepper. I put it in a 400°F oven for about a half hour; the potatoes were just beginning to brown, and I turned the oven off and headed for the airport to get my wife. Once we were happily home, I completed roasting the potatoes at 400° for 10 more minutes or so. I took advantage of her not eating my dinner to use up and grill in my cast iron pan some open tempeh and seitan, and make tacos with them - she doesn't particularly like tacos. I didn't make dinner yesterday but thought that I would visit with my parents and enjoy my Mom's cooking after my photography class (the last of a series of six). She made delicious thin-crust pizza, and also had some tasty leftover Spanish rice - particularly good given that she didn't use onions (which she doesn't eat), and it still had a rich flavor with a lot of dried oregano. Since last May, I have made my "conference call risotto" several times, and it's always great - a testament to a tried and true traditional dish. I made it like I have in the past, using porcini mushrooms and onions. 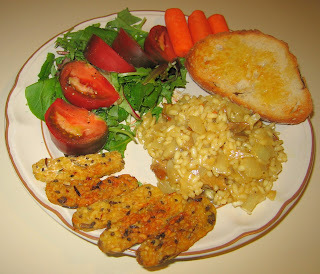 I also served some sauteed tempeh and that tasty garlic and herb bread (toasted) that I purchased yesterday. I wish my wife were here to enjoy it, too! She is enroute back and should be here Friday evening. 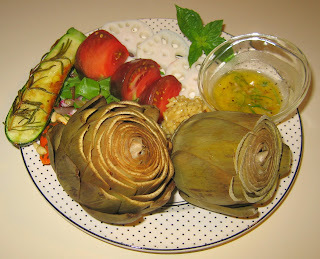 Last May, I learned to sautee baby artichokes. I've not prepared them in some time, but found these babies at a good price yesterday, and cooked them today. I removed the outer leaves by hand of each of four baby artichokes till lighter yellow and tighter underlying leaves were exposed, then cut the top 3/4" or so off, as well as the bottoms to leave a little stem stub, and quartered the artichokes, immediately rubbing a little lime on the cut surfaces to minimize browning. I then sauteed over medium heat the artichokes, a small amount of wheat gluten chunks (maybe 3/4" long by 3/8" wide), and a medium shallot, cut into long pieces maybe 1/4" by 1". A few minutes later, I added approximately a tablespoon of fresh rosemary needles and a few teaspoonfuls of fresh oregano leaves. Once the artichokes were starting to brown a little, maybe after a total of 7-8 minutes, I added another 1/2 teaspoon or so of oregano, as well as a little salt and freshly ground black pepper. I served immediately, along with a salad including chopped baby yellow carrots. I found some tasty organic roasted garlic and herb bread today, and lightly toasted two slices and topped with heirloom tomato slices. It was a good dinner! 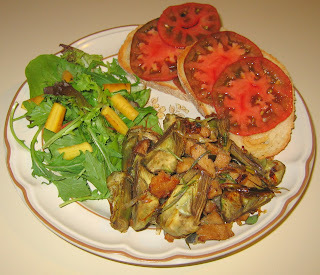 I'll have to make this seitan-baby artichoke combination for my wife sometime. Incidentally, I was shopping today and enjoyed a sampling that was going on of Kagome juices. I've tried these vegetable juices before and found them not so much of my taste. But they have new fruit and vegetable blends and they are very good! They were also on sale, so I picked up some Ruby Pomegranate Harmony (the best! ), Purple Roots and Fruits, and Yellow Mango Orchard flavors. It was about a year ago that I discovered broccoli di Cicco, an Heirloom sweet type of broccoli which is entirely edible. I cut about half of a package of tempeh into 1/4" or so slices, then, perpendicularly, divided these slices into thirds. I sauteed, in Greek extra virgin olive oil, the tempeh with about half of a small onion that I had cut into approximately 3/8" cubes. When the onion started becoming clear and the tempeh browned to a medium color (not fully golden brown, a total of maybe 6-8 minutes over medium-high heat), I added stalks of broccoli di Cicco and sauteed for about 3 more minutes, letting the tempeh get golden brown and the broccoli di Cicco not get overcooked, but simply turn a vibrant green. I then put in a few tablespoonfuls of organic Baja Lime marinade, a little salt, and maybe 1/8 teaspoonful of chili powder, stirred for half a minute or so, and served. 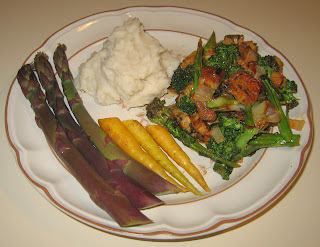 I also had baby yellow carrots, mashed potatoes, and purple asparagus. To keep the lovely purple color, I parboiled the spears of asparagus by putting them into boiling water for barely a minute, then plunging the spears into cold water (I didn't have ice, so cold tap water had to do). It was a good dinner! This morning, I had to wake up very early as I was a guest on a television station. A local group, Humane Carolina, had inspired them to air a story on the connection between diet and environment, and asked if I'd be the spokesperson. The group arranged food to bring to let station staff try, including the woman who tried the food during her interview with me. I haven't seen the footage, but think it went okay, though it was so short, I didn't get a chance to mention our upcoming Thanksgiving. I made a simple dinner tonight, starting with frozen prepared "pot stickers" - Chinese (jiaozi) or Japanese (gyōza) dumplings. They need to simply be put down into a pan with a little oil to brown the bottom for about two minutes, then are steamed. I served these with soy sauce but found, alas, that I didn't much care for them. I also made green beans in the style we saw last year in Tuscany, simply grilling them briefly in a little olive oil, then serving with fresh lime (or lemon) juice and salt. I picked up a new product a few days ago, and also served it - a kind of Italian pretzel, Tarallini with fennel seeds. Tarallini, rounded bread sticks from the southern part of Italy including Apulia in the southeast, are delicious and would be great as a snack by themselves. >I sliced a few pieces of seitan into thin, flat pieces, and grilled them along with a thick (maybe 3/8") slice of onion for about 15 minutes on medium heat, adding a portabello mushroom cap for the last 8 minutes or so. I served this "stacked", along with a lotus root slice, parsnip, and corn that I had flame-roasted then stripped from two cobs and mixed with Earth Balance margarine, salt, and fresh lime juice. The main course was good but could have used a little hot sauce or citrus marinade to give it a little more complex flavor. Dinner was fairly simple today. 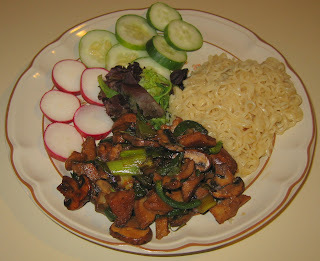 I made an easy saute with small chunks of seitan, cremini mushrooms that I had sliced into thirds or so, green onions cut into 3/4" pieces, and little slices of poblano pepper. I served this with some Ramen noodles. While my wife is away, I am taking advantage of being able to make dishes that I normally don't get to eat because she isn't fond of these particular foods. 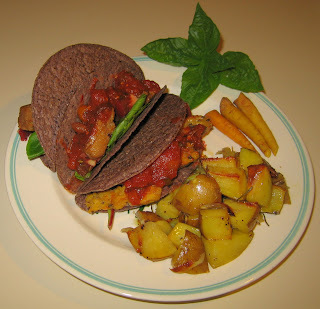 For example, she claims that she isn't fond of Mexican food, though she liked the tortilla salad that I made in February and loved one of the very first dinners that I prepared for her more than three years ago, fajitas. Tonight, I had photography class; normally my wife and I eat out afterwards, but I thought I would come home and make something simple since she is traveling for another week or so (she is to return next Friday). I had some organic frozen Potatoes O'Brien (cubed potatoes, bell pepper, and onion), and simply sauteed it, stirring occasionally, over medium-high heat in a little bit of oil for about 10 minutes. 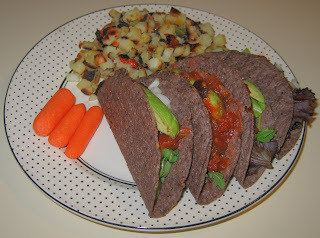 I heated blue corn taco shells and filled them with onion, avocado, salsa, and lettuce. It was a simple but good and filling meal. Tonight, I made a simple dinner of macaroni and "chreese", a vegan boxed food that comes just like standard macaroni and cheese with shells ready to boil for 7 minutes or so, as well as a packet of vegan "chreese" that I mixed in with some plain hemp milk. I also briefly grilled four green onions cut into 3/4" or so lengths as well as about 2/3 of a medium poblano pepper, and mixed these in with the macaroni. By the way, I put together a proposed menu for our annual Thanksgiving, the country's largest with almost 500 expected (check out last year's event website; this year's site hasn't yet been created, but should be soon) and met the restaurant's manager today with the proposal. I am meeting with the chef on Friday. As always, the food will be entirely plant-based with no refined sugar. 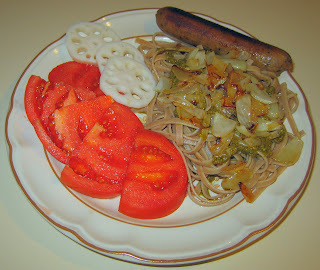 I simply served some grilled onion and pesto sauce on top of the fettuccine noodles, and grilled a vegan Field Roast Grain Meat Company apple-sage artisanal sausage. 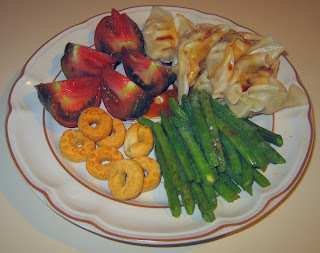 I also served tomato and lotus root slices. It seems like it has been a while since I've been able to make a nice dinner. Tonight, I made a very tasty meal by sauteeing seitan cut into large chunks with large pieces of baby bok choy, onion, and shiitake mushrooms. I also roasted on my gas range's open-flame some corn, then stripped the kernels and mixed in Earth Balance margarine, fresh lime juice, and salt. 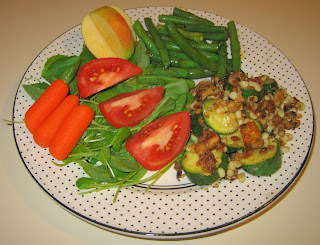 Warning - excuses follow for an embarrasingly simple dinner ... Today was a long day - fun but long and tiring. I was up late last night as I photographed a classical Indian concert, and then I woke up early for morning bridal photography of a young couple whose wedding I'm photographing in two months. After a short rest at home, I enjoyed the rest of the afternoon and on till almost 11p (!) attending the tenth annual Carrboro Music Festival. It's a great event with (this year well over 100!) musical performers all around charming downtown Carrboro, NC - all for free! However, in between all the music and running into and talking with so many friends, I didn't get a chance to eat. I came home close to midnight hungry and tired. So, I made a simple and light dinner. I simply heated canned Health Valley brand organic mushroom-barley soup, baked some frozen French bread rolls, and served roasted yellow tomato slices in the baked bread. 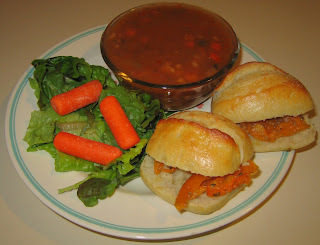 I hope to return to having more normalcy about my dinners tomorrow!